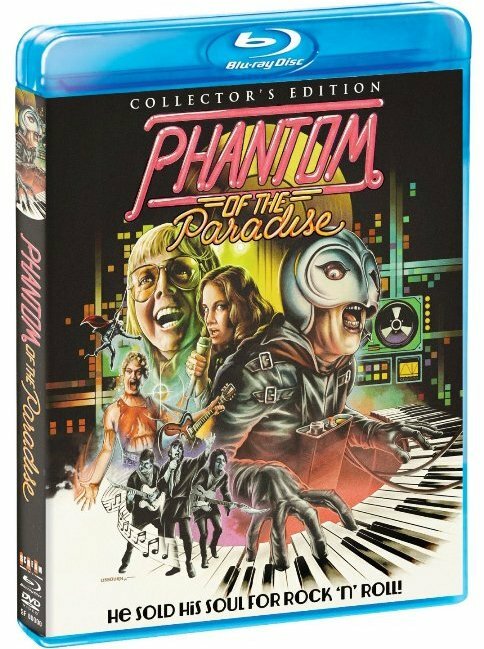 Schlock-Wire: Full Specs For Scream Factory’s PHANTOM OF THE PARADISE Special Edition Blu-Ray/DVD Set – Schlockmania! He Sold His Soul for Rock N’ Roll! The music made him do it! Phantom of the Paradise, the darkly satirical cult favorite from acclaimed writer and director Brian De Palma (Carrie, Dressed To Kill) will make its American Blu-ray debut as a Collector’s Edition 2-Disc set on August 5th, 2014 from Scream Factory. The new edition of this Academy-Award nominated horror musical classic is packed to the rafters with bonus features, including new interviews with Brian De Palma, Paul Willaims and Tom Burman; new audio commentary with producer Jack Fisk, a new audio commentary with Jessica Harper, Gerrit Graham and the Juicy Fruits (Archie Hahn, Jeffrey Comanor and Harold Oblong aka Peter Eibling); as well as a DVD of additional bonus content including a new interview with producer Edward R. Pressman, a new featurette the neon poster art, and much, much more! Fans who order their copy directly from ShoutFactory.com will receive an exclusive limited-edition 18″x24″ poster featuring the newly commissioned cover art. Nominated for an Academy Award for Best Original Song, Score and Adaptation, as well as a Golden Globe Award for Best Original Score – Motion Picture, Phantom of the Paradise is the Faustian tale of Swan, (Paul Williams, who also wrote the acclaimed score) an evil record tycoon who is tormented by the disfigured composer Winslow Leach (William Finley, Sisters) he once wronged. Also starring Jessica Harper (Suspiria, Shock Treatment) and Gerrit Graham (Used Cars, Terrorvision), Phantom of the Paradise is a hilarious send-up of the glam rock era that is pure entertainment from beginning to end. Shout! Factory will continue to present the on-going SCREAM FACTORY™ home entertainment series in 2014 with specific release dates, extras and key art. Meanwhile, fans are encouraged to visit the Scream Factory main website (www.screamfactorydvd.com), follow them on Facebook (www.facebook.com/ScreamFactoryDVD) and Twitter (@Scream_Factory) or to view exclusive video content on YouTube (http://www.youtube.com/user/ScreamFactoryTV).